Published in the September issue of Rhythms. Excerpt below. After overdosing on rock ‘n’ roll, Joe Bonamassa is going back to basics. Recently, I’ve been listening a lot to Joe Bonamassa’s new cut, Driving Towards The Daylight. Ever since it landed on my desk a month or so ago, it’s become one of those ‘go to’ records for me, something I’ll throw on whilst trawling through emails, doing my accounts or any number of other tasks that require musical accompaniment (which to be honest, is almost anything). It’s a record which grabs me just right, and it’s one that has become my favourite from the already expansive Bonamassa canon. And this is for a number of reasons. Firstly, it’s a lot more bluesy than the man’s past few records have been. I love his seamless integration of blues and rock ‘n’ roll, but I love more his blues nous – he seems to feel very comfortable with (almost) nothing but 12 bars, and it shows in the playing. Secondly, it’s possibly one of the most mature records Bonamassa has released in his 12 years as a solo artist (this new one is his 13th studio record). His earlier work, and he’ll be the first to admit this, saw him with everything to prove to everyone and as a result, his music wasn’t much more than exorbitant guitar antics; all style, very little substance. This new one then, is more refined – there’s flash, of course, but it’s in the right place at the right time, and it makes for compelling listening. 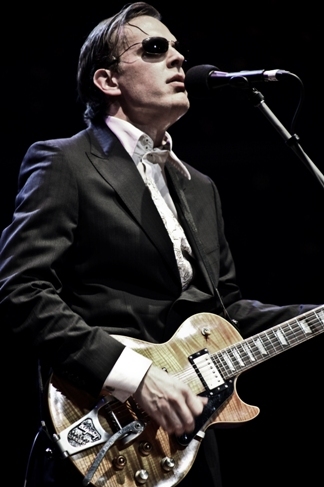 The record begins with the track ‘Dislocated Boy’, one of four Bonamassa originals contained within. This is something he’s begun to do on a regular basis – write. He’s always been one to lay down stone-cold killer cover versions, as he does elsewhere on this album, but over the course of perhaps his past four or five records, he’s started to try his hand as a songwriter. He’s not setting the world alight with his writing skills (something else I’m sure he’d admit to), but they’re songs from deep within and as such, they resonate, whether you give him kudos for his word play or not. It’s all this combined then, that makes Driving Towards The Daylight such a good record, in my own humble opinion, and it’s certainly one of Bonamassa’s favourites, as he tells me when we catch up once more. It’s the best one they’ve done in a few records, he says, helped in no small part by the fact that it is an actual blues record, something that was, he hints, well past due. This album then, is touted as a “back to basics blues record”. 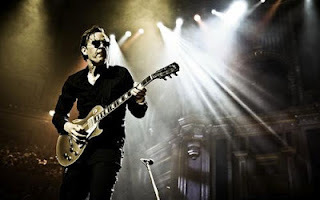 As I mentioned in my review of Driving Towards The Daylight last month in Rhythms, back to basics for Joe Bonamassa is a tall order for the rest of us mere mortals – even when he’s playing 12 bar, it’s out of this world. However, it’s not a back to basics record in terms of technique, but more in terms of the music contained within, moving away, as it is, from the scorching blues/rock he’s become known for, and towards the British blues invasion sound, albeit warped for the now. “We got a little worldly there for a while,” Bonamassa smiles. “We did Black Rock (2010) which had bouzoukis and all kinds of Greek instruments on it. Dust Bowl (2011) started as kind of an extension of that but finished off as something else, like a country record, with John Hiatt and Vince Gill. So [those records] took on this whole worldly / Americana thing, which I think is great.